Absent major efficiency gains, the added power demand will make it much harder to achieve the kind of worldwide carbon emissions cuts that would be needed to ward off potentially catastrophic warming levels. The amount of energy needed for cooling will triple, reaching a level equal to China’s total power demand, the new report finds. As the world warms in response to human-caused climate change, the need for air conditioning will become more acute, particularly in the Middle East and South Asia. 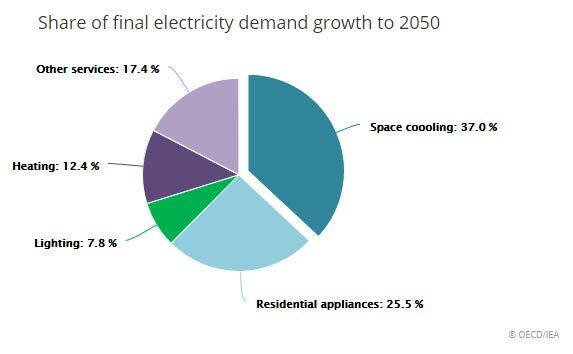 And rising demand for cooling is “already putting enormous strain on electricity systems in many countries,” IEA said.